TEN this week announced Kerry Armstrong in a guest role for Neighbours. 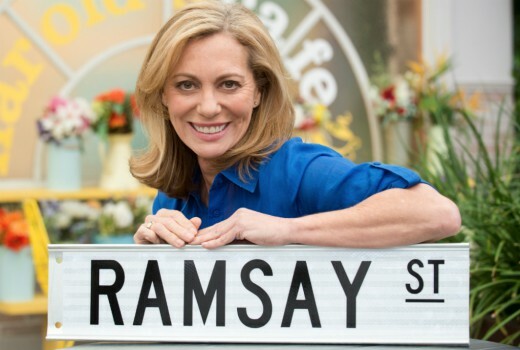 “It is not often you get to be so creative in your own backyard so when the producers asked me to play the role of Alice Wells in Neighbours it was simply irresistible,” Armstrong said. “Alice is a character who pushes every boundary and is a force to be reckoned with. I was looking to challenge and stretch myself to the limits playing a phenomenal character and Alice is just that”. The role also sees Armstrong back at the Nunawading studios where she filmed Prisoner in the 1970s. She will appear on air in late October. This is interesting. I can still remember Kerry bagging Neighbours on The Panel, but I guess that’s going back 20 years now. I liked her in Seachange and Wrong Girl and this character seems interesting. Any info on when she will air? Neighbours is attracting sime big name actors these days. It’s a shame that they don’t have as many viewers as they used to in Australia.